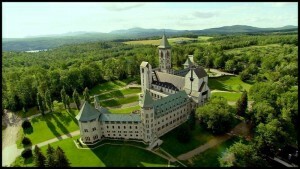 The Institute is proud to announce that its 12th Annual Colloquium will take place between August 10th and 13th, 2017 at the Benedictine Abbey of Saint-Benoît-du-Lac (Quebec). The colloquium programme focuses on practical workshops in Gregorian chant directed by Jean Pascal Ollivry. Workshops for beginners led by Jean-Pierre Noiseux, will also be offered. Dom Richard Gagné, O.S.B., will give a talk on the life and work of his predecessor, Dom Georges Mercure, O.S.B., and on historical recordings of Gregorian chant made between 1936 and 1948 with the monks under Dom Mercure’s direction. The colloquium will conclude with the celebration of Sunday Mass in the church of Saint-Patrice in Magog, where chant will be performed by colloquium participants. Early bird Registration is available until Thursday, June 15, 2017. After that date, the full rate will apply. The Program, Music pdf, and Registration Form are online at www.gregorian.ca .